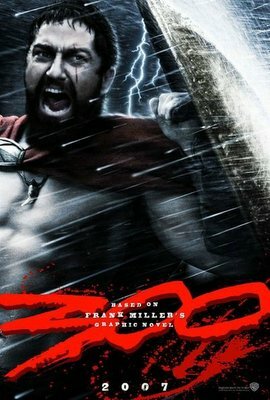 Plot: Inspired by the work of graphic novelist Frank Miller, creator of Sin City, 300 is an epic adventure about passion, courage, freedom and sacrifice embodied by the Spartan warriors who fought one of the greatest battles in history. A ferocious retelling of the ancient Battle of Thermopylae in which King Leonidas (Gerard Butler) and 300 Spartans fought to the death against Xerxes and his massive Persian army. Facing insurmountable odds, their valor and sacrifice inspire all of Greece to unite against their Persian enemy, drawing a line in the sand for democracy. I have conditioned myself that I won’t get to see 300 until the UK release date on March 23. So you can imagine how literally thrilled I was when my friend Richard Brunton – Filmstalker’s founder and resident writer – decided, on a whim mind you, to give me his tickets for the London BFI-IMAX Press Screening of 300. I nearly missed seeing the film after finding out that they were oversubscribed, but Richard helped sort this all out so special thanks to Tom and Jill for making sure I made it to the screening. It was a full house, and before the screening we were given a warm welcome by one of the BFI guys who also gave us the latest US box office figures for 300 sitting at US$70 million, wherein US$3.5 million of which came from IMAX screenings. I’ll let you in on a secret. I have never been to an IMAX screening so I was definitely looking forward to what they describe as the ultimate movie experience, and it really was one helluva. So like the 300 Spartans preparing to go to battle, I also came mightily prepared, armed with my drool bucket and a portable defibrillator in case all of a sudden my heart stops at the sight of Gerard Butler. The film is a visual, orgasmic feast of color, effects and style. Not having read the graphic novel I can only imagine how the adaptation came across as a a true representation of Miller’s comic art form. It was the action sequences that did it for me, with slow motion used just in the right moments adding to the impact of the particular scene, and the fast and often furious moments was also done extremely well. Remember that I am watching this on IMAX, so every blood splattered across the screen is like seeing crimson red blood corpuscles that is magnified more than what you can see on a usual screen with a panoramic view. Sitting there in awe with my heart beating wild and drool slowly dripping on my bucket, I wondered how different it would be if I saw it on an ordinary screen, but with IMAX, it worked perfectly well. And of course there is Gerard Butler. Now, I have a strong suspicion that the success of the film is a combination of the novel’s fanbase, the effective marketing of Warner Bros, and the support of Butler’s own fanbase including yours truly. I have been a Butler fan since The Phantom of the Opera and have followed his career since. He has played a few historical icons in the past, but here, as King Leonidas your heart just goes out to him. The moment you see him on the screen for the first time, you can see a commanding presence that I can only remember seeing when I saw Russell Crowe in Gladiator. His Leonidas is passionate as he is powerful. Butler was utterly convincing as the great Spartan King and warrior and maybe it’s all conjecture but if this was how Leonidas roused his troops to fight against the Persian army during his time, no wonder he got their full support, and all for glory. Some were saying that his Scottish accent was distracting, I actually thought he has mellowed the accent and that it didnt prove to be a distraction at all. This is a solid, powerful film and having said that, Zack Snyder will now be the director to watch, when it has been announced that his next project is another graphic novel adaptation of Watchmen, with Butler also on board to star. If you have to see the same movie twice this year, I recommend that you do with 300, if it fails to impress you for the first time on the ordinary screen, then head off and see it again on IMAX theaters near you, I know I would. *This review is also available in Filmstalker. ← Happy 1st Anniversary to Filmstalker! I was really impressed with the film. It’s not an Oscar type of movie by any means, but it was so much fun to watch. Gerard Butler really impressed me as well. This was one of the best action movies to come out in quite some time. It will be interesting to see it in a smaller screen now after that IMAX experience, wonder if my level of excitement dips though. Totally agree about one of the best action movies I’ve seen in a while – the choreography of the fights were fantastic! Excellent, very well written review. I don´t think the normal screen, in these Multiplex days, can help but to make the experience poor. I have always thought IMAX and 3-D IMAX were the future of cinema. James Cameron and George Lucas agree with me. At least, all cinemas should be digital by now. Peter, I totally agree with you about having digital cinemas at least! The movie was great. Good effects, good storyline. I would recommend it to anyone. I’ve seen a couple IMAX films and I would wait until it hits the normal theater. The film-grain was obvious and a bit annoying. There was vertical room on screen not being used. I think it was at the 1.85:1 theatrical aspect ratio, not the 1.43:1 IMAX ratio. I left feeling ripped off that I paid the IMAX premium to watch a movie that was really not filmed in IMAX, just enlarged to stretch across the IMAX screen. Being an IMAX virgin, I had no idea about the technical side of things, I can see your point now. Still havent seen 300 on an ordinary screen but will definitely do.